This past weekend I had the pleasure of spending the day with my daughter, son in law and youngest grandson as we watched an amazing Air Show. There were many amazing displays of power, speed, and agility. 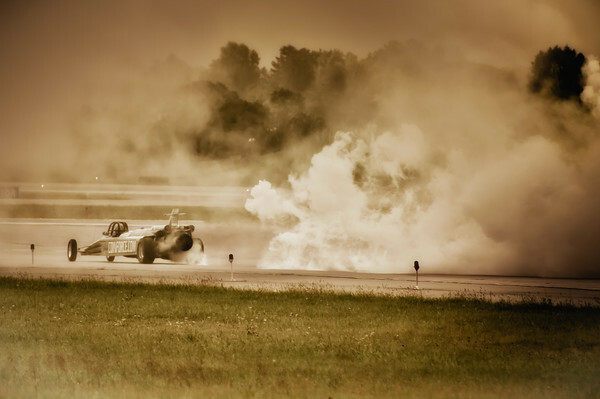 In this image, the 'jet car' is streaking across the run way at a speed >300 mph - Flames shoot out and smoke fills the air as the driver gives the crowd a small sample of what the car can do. Later the car races a jet to determine who is faster. A jet car or ? The weather proved to be perfect for watching and photographing an airshow. It was not too hot and enough sun and clouds to add dimension to the shots. Below is a show with some of the images as stills and video. The song is a recording I made of my daughter singing the next day at Champion Life Church on 9/11/11.